I am not sure if I have said this before in other posts, but for 38 years of my life I did not really care for Greek Food. I was not a fan of tomatoes and it seemed like there was a lot of tomatoes in the Greek food here. When I went to Greece my mind was changed. There wasn’t tomatoes in everything and I liked the way they cooked their food. Although I still believed I didn’t like Greek Lemon Soup. I am not a fan of the lemon flavor for the most part so I never tried it. When there was opportunities to try it there was always either rice, celery, or carrots in the soup in some combination. I do not like rice in soup and I am not a fan of water-laden carrots. I do not like celery. One day we were at a local restaurant and my husband ordered the Greek Lemon Soup. Even though he “doesn’t share food” he let me have a spoonful – it was delicious. It was simple, just chicken and pasta! Ahhhh . . . . I found some Avgolemono I liked! So I decided to make some. I found a lot of recipes online with celery and carrots and rice in some combination, so I didn’t look past the ingredients. I wasn’t finding one to use. I knew I wanted to use pasta. 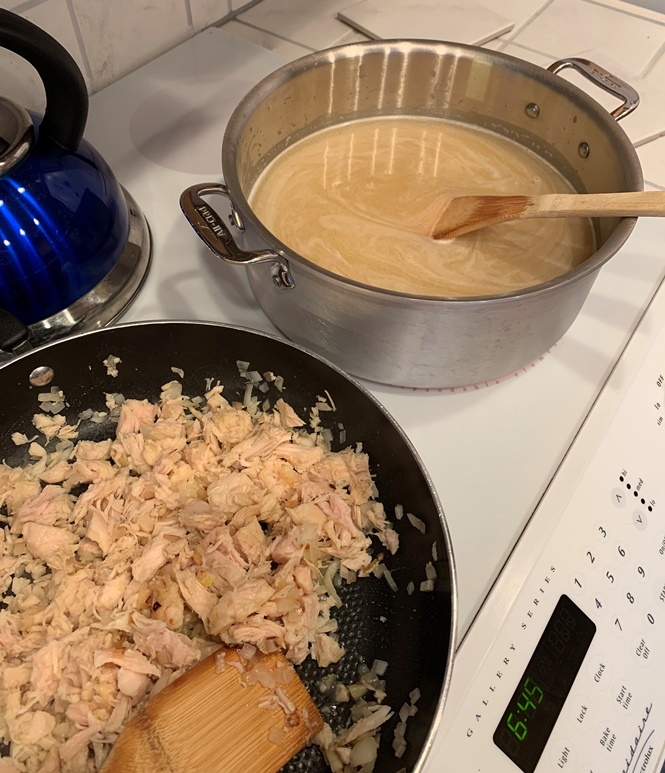 I had purchased some orzo online with the sole purpose of making Avgolemono, but I hadn’t planned on making it the night I ended up making it. I did not make a special trip to the store for ingredients. So I made the soup with what I had on hand, which was a limited number of eggs and canned chicken. Just to put it out there, there is NO CELERY, NO CARROTS, and NO RICE in this soup. Chop the onion. Heat the olive oil in a pan. Cook the onion then add the chicken to the pan to heat it up a bit*. Sprinkle some garlic salt on chicken while stirring. In a large pot, melt the butter, then add the orzo to toast it. Add the chicken broth to the orzo. Bring to a boil. Then let simmer. While the orzo is cooking in the broth mix the eggs together with a hand mixer. Mix the eggs at least 3 minutes on low allowing a lot of air to get into them making them frothy. 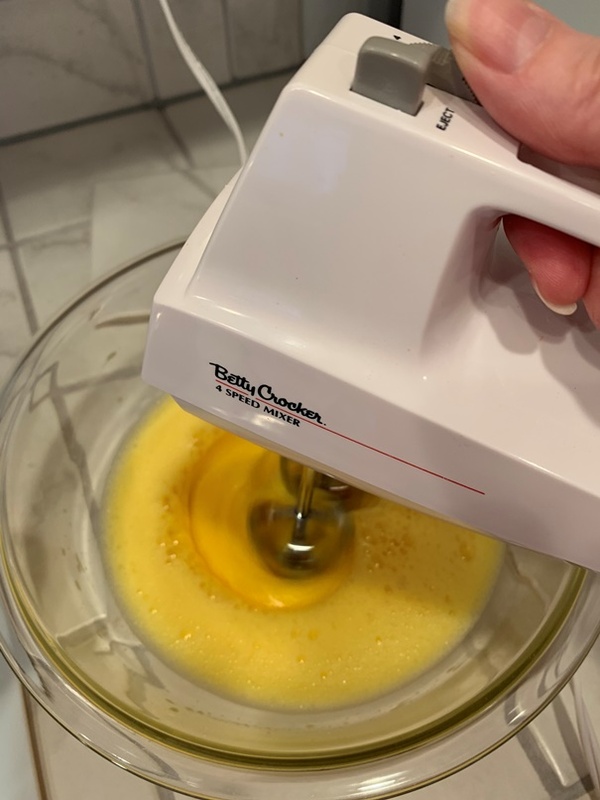 After the “at least 3 minutes,” add the lemon juice slowly while mixing the eggs. 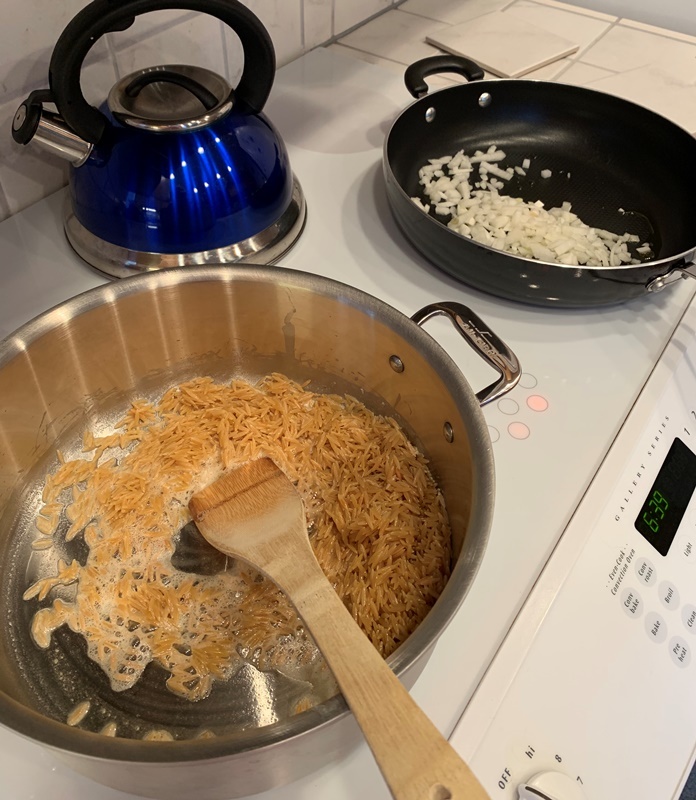 Once the orzo is cooked (about 15 minutes – test to verify) add the egg mixture to the broth BUT not all at once. Put a little bit of broth into the eggs while mixing. Keep adding broth a little at a time to slowly bring the eggs up to the temperature of the broth. Once the eggs are tempered add the mixture to the broth. Stir the egg mixture and broth together. Once it is all incorporated add in the chicken. Mix it all together. Then taste. Is it lemony enough for you? If not add more lemon juice. Or add some lemon zest as garish to each bowl – this gives it an extra zing! I had typed this up to use as my recipe to make the soup. I figured I would need to play with it a lot in order to get it to what I was looking for, but nope. THIS. IS. IT. Oh, except I will use more orzo . . . perhaps a cup maybe more. But I really think that the orzo is all that I will adjust. Originally I wrote the recipe with salt and pepper as ingredients, but I did not add any additional salt besides the garlic salt. And my husband added pepper to his bowl, but said it did not really add anything to the soup so he would not be using it, so I didn’t even try. 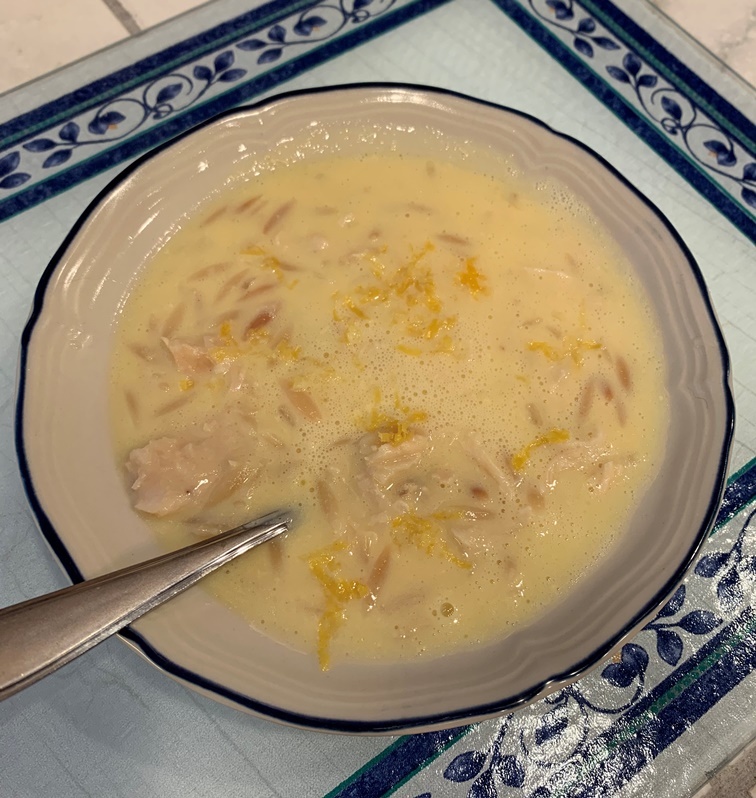 I am going to check in with my uncle who, I am told, makes Avgolemono all the time. I want to know what he does. Although, my husband and I really loved this and so for the most part I will probably just stick to this. But sometimes it is nice to try things a little differently so that is ALWAYS an option. How about you? 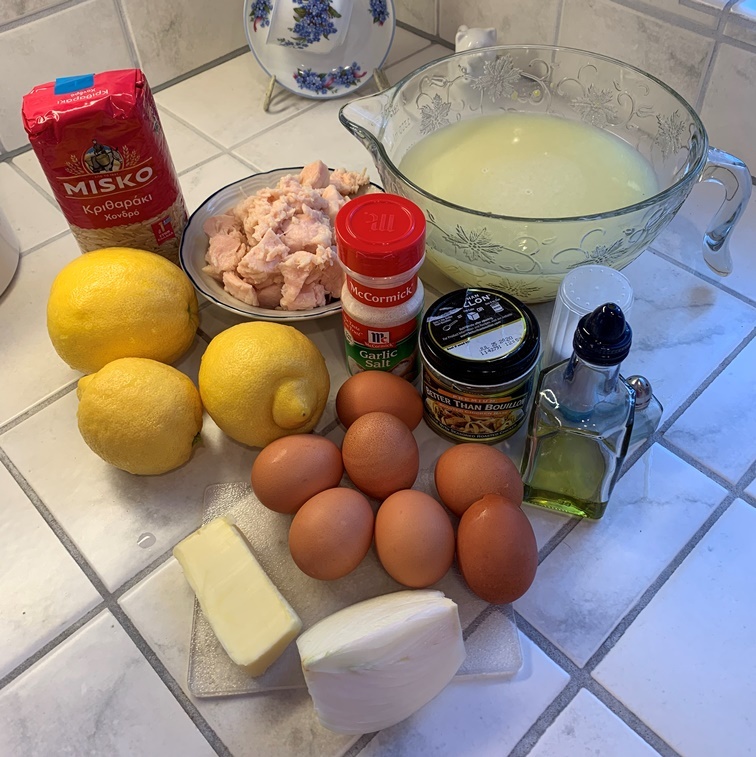 Do you like Avgolemono? Have you found a place that serves one you like? Do you make it? How do you make it?